Thalassaemia is an inherited disorder that is characterized by inability to form haemoglobin in adequate amounts. It is usually seen in two forms i.e thalassaemia minor (trait) and thalassaemia major. In thalassaemia minor the abnormality is inherited from one of the parents whereas in thalassaemia major the affected child inherits the abnormality from both of the parents. When both of the parents have thalassaemia trait there is 25% probability that their child could have thalassaemia major. It is estimated that 5% of the people in Pakistan have thalassaemia trait. Some studies in Pakistan have shown that the carrier rate of thalassaemia may be as high as 30% in the families having children with thalassaemia. Identification of thalassaemia carriers is essential in preventing the births of children with thalassaemia major. Thalassemia screening is becoming a major concern especially after being made mandatory before marriage by some provincial governments. Lack of reliable testing for thalassemia presents a challenge for service delivery across Pakistan. GRC offers a comprehensive service for thalassaemia carrier screening all across Pakistan. The samples may be collected at any part of the country and these can be sent to GRC for testing. How GRC is different from others? 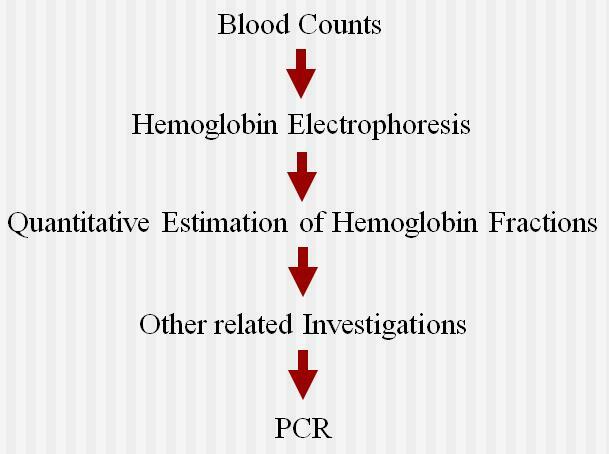 GRC uses a comprehensive test protocol that ensures identification of typical as well as atypical or silent forms of thalassaemia. Most labs in Pakistan limit their testing to Hb-electrophoresis alone. Our research has shown that up to 10% of thalassaemia carriers in Pakistan may have either silent mutations, or co-incidental iron deficiency or alpha thalassaemia. All such individuals may be missed if carrier testing is limited to Hb-electrophoresis alone. This leaves a clear possibility of false negative results. Our scheme of carrier identification includes blood counts, haemoglobin electrophoresis and PCR when required. 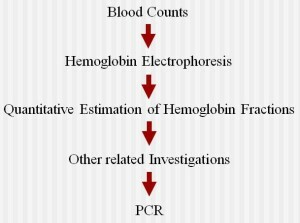 This ensures identification of typical as well as atypical forms of thalassaemia. We offer best possible quality of results in the most competitive price tag. We offer carrier testing for the individuals as well as a package for the complete family. What samples and precautions are required? For the haemoglobin studies we require 3 ml blood in EDTA. The sample may be collected at GRC or at any remote location. The samples should be dispatched to GRC within 24 hours of collection. The samples older than 24 hours may give compromised results. Please note that the results of Haemoglobin studies are significantly altered by recent or multiple blood transfusions. Please note that the results of Haemoglobin studies are significantly altered by recent or multiple blood transfusions. This information is particularly required if the test is being requested to diagnose thalassaemia major. Copyright 2015 Haemoglobin StudiesGenetics Resource Centre .